Made up of a variety of fresh healthy foods, Mediterranean Diet salad recipes taste delicious and are good for you. For lunch add a portion of nutritious, warm whole grain bread for tasty and satisfying meal. Drain the liquid from the garbanzo beans and rinse them well. Cover and refrigerate to chill the salad. Cut the eggplant, squash and zucchini into slices approximately ½ inch thick. Peel the onion and cut it into slices approximately ½ inch thick. Brush the vegetables with olive oil. Season the vegetables with salt and pepper if desired. Gently steam the string beans, drain and set aside. Place the vegetables (not the string beans) on the grill and cook until they are tender, approximately 6-7 minutes. Place the cooked vegetables on a plate. Once the vegetables are cool, cut them into pieces approximately ½ inch in size. Cut the sting beans into ½ inch pieces. Place all the vegetables (including the greens and parsley) into a large bowl. Add the olives, feta cheese, lemon juice and the rest of the olive oil. Combine the last five ingredients and marinate the shrimp in one half of the vinaigrette for ½ hour. Chop the woody ends off of the asparagus. Place the shrimp, zucchini and asparagus on the grill, and cook until done. Chop zucchini into bite-sized pieces. Put the greens in a bowl. Dice the avocado and add it to the greens. Add the shrimp and vegetables from the grill. Drizzle with the remaining vinaigrette. 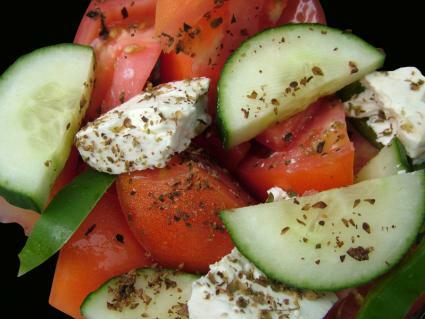 Mediterranean Diet salad recipes are very easy to adapt. Leave out a vegetable you don't particularly like or substitute one you do enjoy eating. If you prefer tuna instead of shrimp, go right ahead and modify a recipe to please your palette. Whether you follow the Mediterranean Diet plan to lose weight or maintain your current weight, according to the American Heart Association, eating a healthy diet reduces your risks of having a stroke or heart attack. Remember to check with your doctor before beginning any type of diet to make sure it is safe for you.